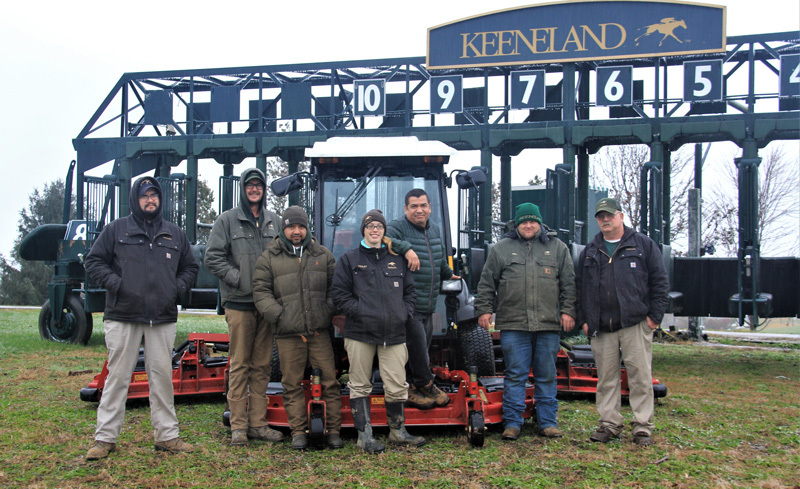 A work day in the life of Keeneland track superintendent Javier Barajas is, more accurately, a day and night. A 9 to 5 job? Try more like 5 to 9—as in a.m. to p.m.—but even that doesn’t start early enough. It’s a good thing that Barajas lives in a house on Keeneland property just a few furlongs from the main track. He and rotating members of his crew are looking at the track by 3:30 a.m. on days when there’s racing or training. His phone often starts ringing shortly thereafter, especially when there’s rain or a pending storm. Are we off the grass? Do I need to change my horse’s shoes? Barajas’ day might not be done until two or more hours after the last race, concluding after 8 p.m., as his crew smooths out the track and puts on the “seal” to prevent any moisture from penetrating the surface or to keep in the water his crew applied. Some days, the turf course rail must be moved or the grass cut. The best track superintendents don’t consider a track just an oval of dirt with a ring of grass inside, but rather a living, breathing creature often displaying different personalities and moods. Sometimes a gentle touch, caressing or cajoling, is required to have the track at its best. Other times, a get-tough approach might be needed. Track supers must determine when manicuring, manhandling or a makeover is in order, and the equipment and procedure required. Jamie Richardson, who took over for David Lehr—Butch’s younger brother—at the Louisville track after previously working at Pimlico Race Course, Laurel Park and Oaklawn, said that freezing weather is among the biggest challenges he faces, along with unexpected weather conditions. A prime example is last year’s Kentucky Derby. “It was supposed to rain on Oaks Day and it never did, and on Derby Day they said light rain in the morning and tapering off in the afternoon, and it did the opposite and rained harder throughout the day,” Richardson said. While the jobs of a weatherman and track super are vastly different, perhaps they are similar in that, as Richardson said, credit is rarely given for a job well done. But after the unexpected deluge at Churchill to kick off Justify’s successful Triple Crown run, Richardson and his crew did earn some well-deserved accolades. Another challenge that many track supers face is getting the proper equipment to do the job right. Even if track supers sometimes work in the shadows, both literally and figuratively, the majority of horsemen and track executives recognize how important they are. “They’re invaluable,” said John Hopkins, Oaklawn’s plant superintendent who oversees track superintendent Kevin Seymour and his team. “If you don’t have a good track super and a good crew underneath him, it’s going to be disastrous when you start racing horses. They work so many hours it’s unbelievable. While praise for a track super might be rare, sometimes they know they are doing a good job precisely because no one talks about them. It can be easy for horsemen to criticize a surface without understanding the nuances involved in maintenance, including the difficulty of finding the right equipment or adequate supplies of just the right soil. “We’re trying to give them the exact cushion, the exact track, every single day, whether we race, train or whatever,” Barajas added. “When you have to deal with weather, it gets a little more difficult, and they don’t always realize that. At 3:30 a.m., we’re looking at the Doppler [radar], seeing if it’s going to be raining, when is it going to start? Or can we train, open up the track, harrow it and give it the 3 1/2 inches of cushion and have it ready for them? We’re making the decision at 3:30, not when they wake up. Barajas is old school and proud of it. But he appreciates the place for the high-tech methodologies Keeneland installed when its Polytrack main track was replaced with a state-of-the-art dirt surface and drainage system in 2014. When Barajas walks the turf course, before training or during the 8 a.m. maintenance break for the main track, he uses a “going stick” to measure the amount of force required to penetrate the surface and strength of the grass roots. The data is automatically recorded, a computer creating a “going report” that rates the turf course firm, good, yielding or soft—though Barajas makes the official determination reported to the public. Tim Fahrendorf, who joined the Keeneland crew after graduating from the University of Arizona’s Race Track Industry Program and prior to that spent 11 years as a groundskeeper for the Arizona Diamondbacks of Major League Baseball, is in charge of data collection and tracking moisture content. Fahrendorf takes daily readings every sixteenth-mile at three, seven and 15 feet from the inside rail on the turf and dirt courses with a specialized probe to determine volumetric moisture content. The massive grader uses GPS to keep the track surface even and track cushion uniform, with 14 satellites positioned 12,400 miles above earth feeding data that directs the grader to the exact height to maintain or create the desired cushion. But even this science relies on human confirmation, with Fahrendorf following behind to manually measure cushion depth from the surface to the limestone base. Barajas calls the new technology “great support” but says that the art can’t be left out of a “state-of-the-art” track. “I’m not really a scientist,” he said. “Doing it 42 years, when I go and poke at the turf, how it feels, I know it’s soft or good or firm. We do have the going stick that does it, too. But at the end of the day, it’s my word against the going stick. But we do have that to back us up. Being a track superintendent quickly becomes a way of life, a future cast early for Barajas. His father worked on Arlington Park’s turf course for 35 years, with young Javier going to work for his dad at age 13. By then, he already was a veteran hotwalker. Richardson was also born into the industry, as his father was a trainer. Remarkably, he is just the fifth track super at Churchill Downs since 1911 and the first not named Lehr in nearly five decades. Prior to the Lehr brothers, Tom Young, who was appointed by Churchill’s renowned general manager and president, Col. Matt Winn, served for 50 years until 1962 when Thurman Pangburn took over for 20 years before the Lehrs. Barajas has tended tracks and courses around the world, including Arlington, Retama Park, Fair Grounds, Canterbury Park, Golden Gate Fields, as well as in Dubai, China, Chile and Peru. He only half-jokingly says that “cholesterol, double and triple bypasses and divorces come with the territory.” The increasing demand for turf racing, making it exponentially more difficult to keep the grass course in good shape, only adds to ever-present angst. Whenever a horse is injured, “You beat up yourself: What happened? What went wrong?” Barajas said. “You double check where the injury happened. First, you have to make sure it wasn’t the racetrack. There are a million reasons why a horse has an injury. The one who is going to get blamed is this big thing here,” he continues as he makes a sweeping motion toward the track. Barajas, who has a 10-person dirt crew and similar number for the turf, says in addition to proper resources, the most important thing that track management can provide is respect. He says he’s fortunate he’s always had that from his bosses. “We should have the same respect as the vice president or general manager,” he said. “This is a very difficult job. If your supervisors think you’re more important than them, that’s really helpful. That’s how I treat my crew. I think if they’re not as good as me, they’re going to be better. That’s what I try to teach to the younger guys. I always tell them that I’m a great teacher because my students are better than me. Barajas said that includes understanding the importance of track superintendents getting together at events such as the Track Superintendent Field Day (see sidebar). Hopkins said such events, which he regularly attends, are incredibly beneficial—especially when he and other managers are kicked out so just the track supers can talk freely among themselves. He said it’s not just a good trackman who is invaluable. The horse racing industry certainly has no shortage of meetings, conventions and conferences, but one of the most important might be one that relatively few horsemen know about. The Track Superintendent Field Day has been held annually since 2002 and is set for the 2019 renewal on June 24-26 at Charles Town Races in West Virginia. The agenda includes numerous workshops and equipment demonstrations plus the chance for track supers to share insights and best practices among themselves. Thanks to sponsors, including title sponsor Equine Equipment, there is no charge for registration and a discounted hotel rate is available. “Years ago, I think sometimes people had tunnel vision and guys maybe had never been to other tracks,” Churchill Downs track superintendent Jamie Richardson said. “So this meeting is very beneficial. Now you see something that someone else is doing and maybe it works at your track. The more you see and the more information you have, the better it is for everyone, so it’s been great to get out and talk to other track supers and see other tracks. For more information, go to tracksupers.com.